The profile on the earth works sculptor Michael Heizer in the recent New Yorker is a fantastic read. 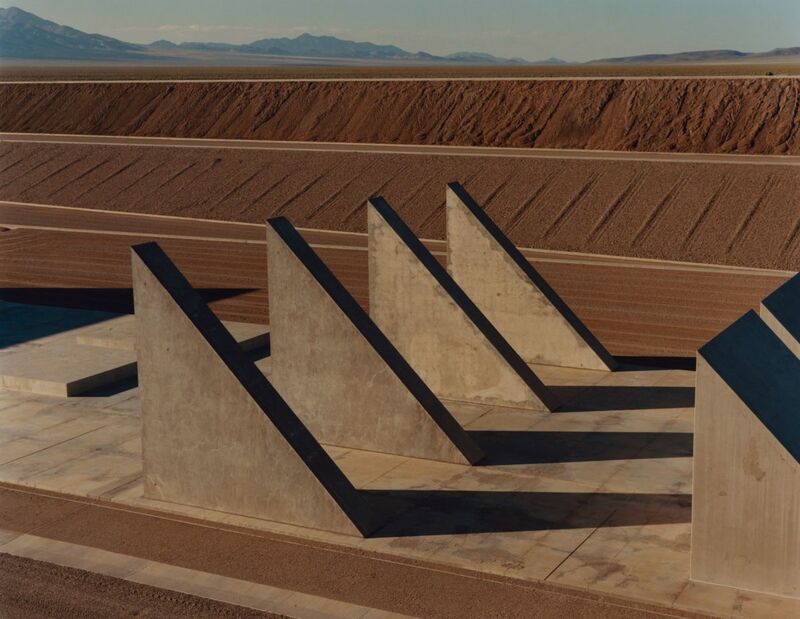 Written by Dana Goodyear and entitled, A Monument to Outlast Humanity, you learn about his decades long project, City, and Heizer’s personality that feels cliché in its cantankerousness but also touching —like a dog who snaps at you but only because its ribs are sticking out. I didn’t know anything about Heizer's biography and only a bit of his art but this article gleaned into him with both intimacy and distance which speaks to the journalistic aplomb that Goodyear is capable of. Below is one section of this rather long piece. I picked it out because it speaks most of his background (and probable sources for the chips on his shoulders) and also shows the origins of his vehemence against Robert Smithson. It was sort of amazing to read about Heizer’s acidic hate for Smithson who is an artist that has been canonized the minute his plane crashed into the ground. Read the below for a taste and if you like it read the whole thing here: http://www.newyorker.com/magazine/2016/08/29/michael-heizers-city. Heizer first came to New York in 1965, a runaway, straight-F student, sometime motorcycle racer, and art-school dropout from the East Bay whose father, Robert Heizer, a world-renowned field archeologist and professor of anthropology at Berkeley, had excavated extensively in California, Nevada, and Mexico, and was particularly interested in petrology: the rock sources of ancient religious monuments. His mother, a singer who had given up a career in order to raise children, was the daughter of a geologist who, as the chief of California’s Division of Mines, mapped the state’s mineral lodes. (Heizer’s paternal grandfather was a mining engineer in Nevada.) From childhood, Michael Heizer understood himself to be an artist. When he was twelve, his parents, realizing that formal education didn’t suit him, allowed him to leave school for a year in order to accompany his father on a dig in Mexico. His role was to make site drawings. Among artists, an idea was beginning to take hold that art needed to be liberated from the constraints of galleries and museums. No more objects: collectors had enough pretty things to put in their uptown apartments. Art should sweat a little. Robert Smithson—a brilliant talker, aesthetic shape-shifter, and amalgamist—appointed himself the spokesperson of the movement, and frequently expounded on art’s new direction in essays in art magazines. (His peers sometimes referred to him as Egghead.) In the fall of 1967, Smithson published an influential piece in Artforum, declaring, “Pavements, holes, trenches, mounds, heaps, paths, ditches, roads, terraces, etc., all have an esthetic potential.” Bulldozers could be used as paintbrushes; someone, he suggested, could sculpt a “City of Sand” of man-made dunes and pits. By this point, Heizer had been in New York for a couple of years, going to Max’s, mixing Soyalac for the baby, and working intensively on “negative paintings,” canvases with geometric excisions at the edges. That winter, he decided to make a trip to the Sierras, where as a kid he had spent summers at a family cabin near Lake Tahoe, shooting off rockets in the dry lake beds and digging up Native American artifacts. In the snowy woods near the cabin, he excavated a pair of pits, lined one with plywood and the other with sheet metal, and declared the results to be ultra-modern art. The Escher-like inversion was simple but profound, a gesture that helped open to sculpture a new, subterranean dimension. “I make something by taking something away,” Heizer later told the Italian critic Germano Celant. He followed the Lake Tahoe pieces with a highly publicized series of trenches, troughs, heaps, and voids along a five-hundred-and-twenty-mile stretch of the Nevada desert, laying claim not just to a particular landscape but to the expansive idea of land itself. The next year, he took Smithson on his first trip out West, hosting him and his wife, Nancy Holt, at the cabin, and leading them on a rockhounding expedition to Mono Lake. (Super-8 footage, which Holt edited into a short film in 2004, shows Heizer, bare-chested, in a denim jacket, cowboy hat, and jeans, rolling boyishly down a cinder mountain.) Smithson continued to pitch the developing movement, often featuring Heizer and his projects as case studies. “Heizer calls his earth projects ‘the alternative to the absolute city system,’ ” he wrote admiringly in Artforum. Before long, Smithson was quoting Heizer’s father in his pieces, and citing Heizer’s brother in published conversations. Heizer told me that he felt as if Smithson were stealing his identity. “I took him out West, and he decided, Now I know all this guy’s secrets,” Heizer says. The pattern was set, for life and for art: the more Smithson built Heizer up, the more furiously Heizer detracted, avoided, and denied. “Double Negative” is fifteen hundred feet across—roughly the length of the Empire State Building laid on its side. To Heizer’s chagrin, the sculpture is also exactly the length of “Spiral Jetty,” a strand of rocks that coils into the Great Salt Lake like a fiddlehead fern, which Robert Smithson completed, with Dwan’s backing, a few months after “Double Negative” was done. The inspiration for the site, Smithson told people, was that formative trip to Mono Lake. Heizer has spent much of the past half century working on “City,” which is situated near his ranch in the Nevada desert. He has allowed almost no one to see it before it is finished. The best way to see “Double Negative” is from the air. Not long ago, Michael Govan flew me over Mormon Mesa, the site of the sculpture, in his plane, a single-engine 1979 Beechcraft Bonanza. From eight thousand feet, the mesa spreads like buttercream, riffled with small ranges down its sides. The edge is scalloped; across one indentation spans “Double Negative.” As I scanned the khaki-colored top of the mesa, my eye was drawn to the muddy flush of the Virgin River, heading toward the chalky turquoise puddle of Lake Mead. The monumental sculpture was nowhere to be seen. Then the plane banked, and suddenly it appeared, two black, shadowed depths feeding into a chasm where the side of the mesa falls away toward the valley floor. “Think of it as a hieroglyph,” Govan said. “Mike is the last of the great modern artists interested primarily in formal shapes.” Heizer, who used to supplement his income by gambling, says that the two cuts plus the chasm represent slots on a roulette wheel: the double zero at the top and the house zero that sits opposite. Dwan donated “Double Negative” to the Museum of Contemporary Art, in Los Angeles, in the eighties, and Heizer hasn’t visited it for years. The degradation there depresses him: its clean, deep cuts have filled with boulders calved from the sides. Though he originally intended the piece to respond to time and ultimately be reclaimed by geologic processes, at some point he changed his mind, and now hopes to find the money to restore it. Govan thinks that this reversal came partly because Smithson championed the principle of entropy, and Heizer wanted nothing to do with an idea associated with his nemesis. Soon after the sculpture was finished, Heizer decided to go where no one could hear him talk.